*Or regular black beans if you can’t find any. Black turtle beans pack more flavor and a creamier texture. I order mine from the desert hippie heaven, Native Seed, in Tuscon, AZ. 1.) Grab your trusty ol’ Dutch Oven and heat your olive oil over medium-high heat. Add the onions and cook, stirring occasionally, until browning and fragrant, about 10 minutes. Add garlic, coriander and chili powder, stirring constantly. Be sure to distribute the spices evenly over the onions, using your wooden spoon to badger any clumps of spices into compliance. 2.) Add the chiles, oregano and beans, stirring to coat. Then, add 10 cups of water and bring to a boil. Leaving the lid slightly ajar, reduce heat to low and simmer until beans are tender, about 1 1/2-2 hours, depending on your beans. Stir in salt and pepper. 3.) Stir in squash and simmer, uncovered, for 15 minutes. Then, add quinoa and continue simmering for 15 more minutes, until squash fork-tender and the quinoa has released its little curly q’s (a fool-proof sign it is done). Sample your fiery pot of wintry beans and squash, seasoning with more salt and pepper if necessary. 4.) To serve, pass around bowls of sliced purple onion, freshly chopped cilantro, canned jalapeno rings and, of course, hot sauce. 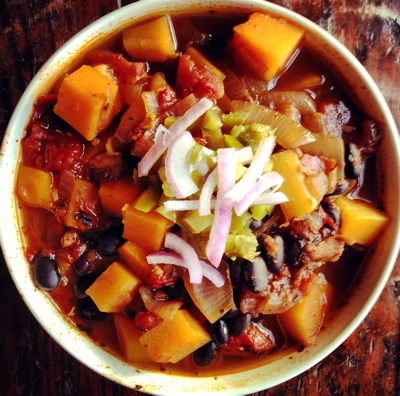 This entry was posted in Main Courses, Soups, Vegetarian and tagged Black Beans, Butternut Squash, Chili, Chipotle Chile, Quinoa, Tomatoes, Vegetarian. Bookmark the permalink. Thank you, Janet! You brought a big ol’ smile to my face. Happy to see you’re still following!